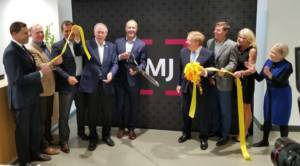 MJ Insurance executives and Carmel City Council members participated in a ribbon-cutting ceremony to celebrate the reveal of the new location. Large open spaces with floor-to-ceiling windows offering views of the Monon greenway, a bold color palette of brightly lit citrus green and vibrant royal blue and cross-functional, collaborative areas highlight the company’s new design for productivity within a creative space. MJ Insurance is one of the nation’s largest privately-held insurance agencies. For more information, visit MJInsurance.com.